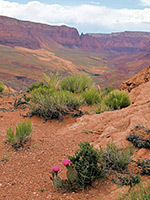 In far north Arizona, the Vermilion Cliffs are the most visible natural feature in one of five BLM-administered national monuments that were established in 2000. Like the other four, Vermilion Cliffs National Monument is marked only by a few signposts and is likely to remain largely without any particular visitor facilities or other improvements - this is a place for people to explore by themselves, though still most tourists zip by on US 89 or US 89A, en route between Zion National Park, the Grand Canyon and Lake Powell, without stopping in this scenic region. 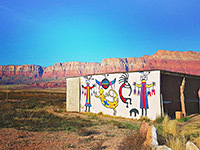 Much of the area is an isolated plateau, flat and sandy, with just a few scattered ranches and occasional 12th century Anasazi remains - known as the Sand Hills or the Paria Plateau, access is very limited and the only attractions are a few small outcrops of swirling, multicolored rock formations, most famous being White Pocket. 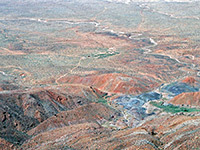 Instead, the more interesting parts are along the edges; to the north is the lower Paria River Gorge, a deep, watery canyon that rivals any in the much more famous Zion National Park, while the west edge of the plateau is delineated by a long ridge of eroded, upturned, eroded strata which has much colorful, weathered rock formations including Coyote Buttes and the Wave. 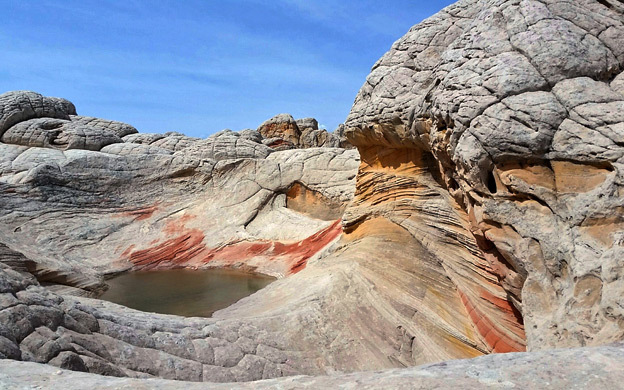 The south and east edges are formed by the Vermilion Cliffs themselves, which must be one of the most spectacular and extensive cliff faces in the US - unusually colorful because of the especially variegated Chinle Formation that forms the lower strata, the escarpment runs for over 30 miles and reaches heights of 2,000 feet. Further southeast, the land is quite flat for 100 miles or more though is split by the Colorado River, at the start of its Grand Canyon. 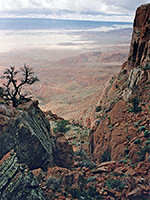 The Vermilion Cliffs and their foothills, the lower canyon of the Paria River and the Coyote Buttes are also part of the Paria Canyon-Vermilion Cliffs Wilderness Area, which extends a few miles northwards, beyond the national monument boundary into Utah, to incorporate the Buckskin Gulch slot canyon and adjacent lands. Besides these regions, most people encounter Vermilion Cliffs National Monument when driving along US 89A between Lees Ferry and Jacob Lake on the Kaibab Plateau - 40 miles of impressive scenery with the cliffs on one side and the vast, level plains around Marble Canyon and House Rock Valley on the other, followed (to the west) by a steep climb into pine forest at the edge of plateau. 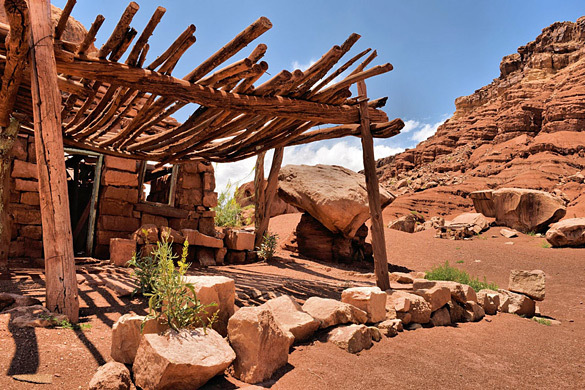 Apart from the Ferry, the road passes just one other significant settlement, Cliff Dwellers, which consists of a few adobe buildings nestled amongst crumbling rocks and oddly shaped boulders, including a restaurant, lodge and gas station. There are plenty of places for free primitive camping along dirt tracks either side of US 89A, mostly on the southeast side, for example near milepost 548 where a short side track leads to a corral, also used as the trailhead to Soap Creek. 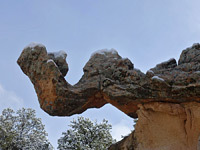 Apart from camping beneath the cliffs or just driving past them, one obvious goal is to climb to the top, but the sheer Navajo and Moenave sandstone restricts easy routes to just three, one via Bonelli Spring, reached by a side track near milepost 561, and two a few miles away near Jacob's Pool, one of which is described below. Jacob's Pool and nearby Rachel's Pool are a series of small springs at the foot of the Vermilion Cliffs that were once used by, and are named after, the family of John D Lee who founded Lees Ferry. 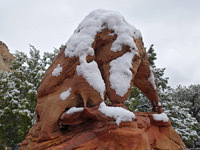 The area is reached by a 2 mile side road that leaves US 89A between mileposts 557 and 558, near a historical marker commemorating the Escalante-Dominguez expedition of 1776. The road passes through an unlocked gate and ends at an abandoned stone house dated 1951, next to an old corral and other relics, which is a good place to park, or camp. The shortest route from here to the top of the cliffs is to walk eastwards along a disused track parallel to a fence, across then beside a small drainage and up to one of the springs - an area of dense bushes and trees from which a small stream flows. A trail begins when the track ends, leading up a slope left of the springs, across a flatter rocky area then ascending a longer slope of increasing steepness. It trends right, climbing more gradually then sharply once more to the base of the sheer Navajo sandstone layer, finally cutting back northwest along a cairned track to the foot of a narrow crack in the top of the cliffs, which has a number of petroglyphs and inscriptions of early travelers etched on the rocks at either side. The path continues up the crack then fades away once at the top. 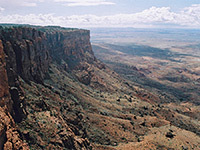 This part of the plateau is mostly sandy apart from scattered rocky outcrops, mostly eroded beehive/teepee formations. Views from the edge encompass countless square miles of the Colorado River valley and the more distant Kaibab Plateau, though all this expanse is rather featureless and the scene is not particularly good for photography. 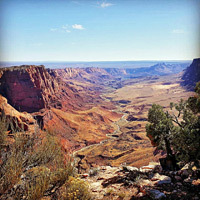 The nearest towns with hotels close to the Vermilion Cliffs are Page and Kanab.